Mitsutoshi Kubota – company director at SHAFT, Inc. As executive producer, he has been involved in planning all of SHAFT’s works, including the Monogatari series. Atsuhiro Iwakami – a producer from Aniplex Inc. He has handled many of SHAFT’s works, including the Monogatari series. —Please tell us about how Kizumonogatari came to be adapted as a series of cinematic films. Iwakami: I first got my hands on the Kizumonogatari novel while we were working on the Bakemonogatari anime adaptation. At that time, I wasn’t even thinking about adapting it, just that I’d gotten my hands on a continuation of the Bakemonogatari novels. And then, the response to Bakemonogatari when it aired was way beyond our expectations, and Kubota-san and I had a chat along the lines of “Let’s animate Kizumonogatari too!” That’s where it all began. Kubota: Bakemonogatari is a work where Nisio Isin’s unique voice is one of its biggest charms, so when Iwakami-san first brought up the idea of animating it, I was, to be frank, wracking my brains about how to visualize it. In contrast, Kizumonogatari came across as something that would work like a single, self-contained film, a slice of easy-to- understand entertainment. But when we first discussed adapting it as an anime, I didn’t even think for a second about making it for the cinema. Iwakami: However, we came to the conclusion of “Let’s make it a movie” pretty easily, didn’t we? Like, “It’d be great for the cinema, huh?” (chuckles). After we made the decision to animate it, I don’t remember there being any disagreements over what format it should take. —In deciding that Kizumonogatari would be adapted for the cinema, was there anything that you decided to do differently compared to the Bakemonogatari TV series? Oishi: Well, theaters have something about them. Like, there’s a sense that “They’re a different kind of experience,” don’t you think? Hence, we wanted to make a film that would enable the audience to empathize with Koyomi and experience the events from his point of view. In concrete terms, we cut pretty much all of his monologues from the script. Iwakami: That approach is pretty standard for a movie. In fact, in the subsequent TV series that have been helmed by Director (Tomoyuki) Itamura, we actually increased the amount of detail they contained by bringing to life—through character monologues—some of the narrative descriptions in the original novels. We’re using the same Monogatari series as the base, but with Kizumonogatari and the various TV series, there’s a sense that we’re evolving in different directions. Oishi: Aside from that, compared to Bakemonogatari, I wanted to take a bit more time to show the shifts in how the characters felt. This also stems from my desire to have the audience empathize with Koyomi. 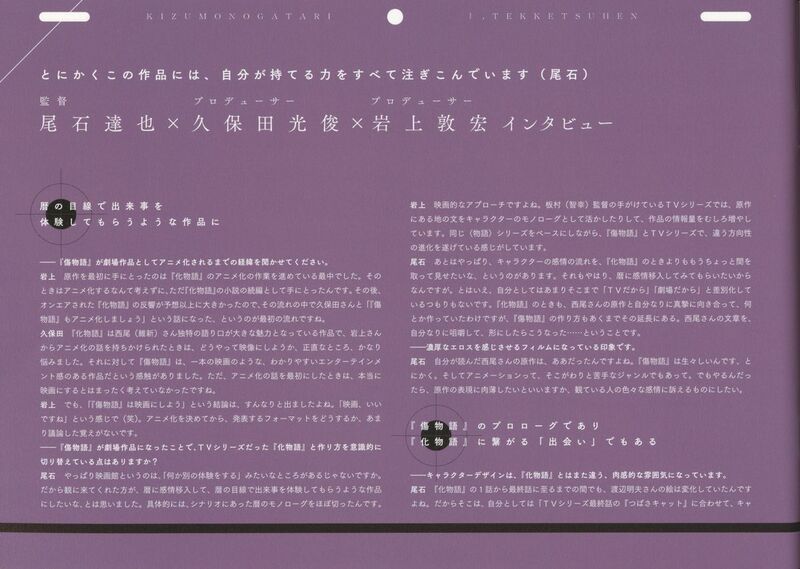 That said, personally, I wasn’t really aiming to make a clear distinction ‘because it’s for TV’ or ‘because it’s for the cinema.’ Even when I was working on Bakemonogatari, I faced Nisio-san’s work head-on in my own way, and managed to make something of it. Kizumonogatari is simply an extension of that. I was basically breaking down Nisio-san’s writing style in my own way, and giving it form…and this is what we ended up with. —The impression I’ve gotten is that it’s a film from which you can sense a deep sexual tension. Oishi: That’s how Nisio-san’s original work came across to me. Kizumonogatari is incredibly visceral. And that’s a genre that we don’t really like dealing with when it comes to animation. But if we’re doing it, then I wanted to get as close to the original as possible; I wanted to the film to evoke all kinds of emotions in the people watching it. —The character designs, too, are different from Bakemonogatari -they feel more sensual. Oishi: Even in Bakemonogatari, Akio Watanabe-san’s illustrations changed between the first and final episodes, right? I wanted to match the final story of the TV series, Tsubasa Cat, so I asked him: “Please update the character designs.” I think that is what made the biggest difference. So even though story’s going back in time chronologically, visually, it’s up-to- date. Iwakami: But they’re different again from how they appear in Tsubasa Cat, right? Oishi: That’s true (chuckles). I always want what I’m working on to take the form that I think is best at that particular point in time. I may also have been influenced ever so slightly by the thought that “it’s for the cinema, after all” (chuckles), but above all, I want to produce images that appeal to the current me. That we were joined by Hideyuki Morioka-san, whom I’ve trusted for a very long time, is also very important, I think. —Speaking of differences between the films and the TV series, you changed the design of the cram school, basing it on the Yamanashi Culture Chamber. Oishi: With regards to that, since there aren’t many characters in Kizumonogatari, and since we also wanted viewers who’d seen Bakemonogatari and thus knew how this story would conclude to see it with fresh eyes, the only option we had was to revamp our visuals. Right from the early stages of production, I wanted to change things around from the TV series. When I create something, I’m the kind of person who starts by visualizing it, and the very first image that came to my mind was a building out of which a large tree was growing. So I looked around for a building that fit this image, and it just so happened that, among the materials that (Nobuyuki) Takeuchi-san had gathered for reference, there was stuff about the Yamanashi Culture Chamber. And when I actually went to take a look at the building, it fit my image perfectly. —The whole film actually looks and feels very different, too. You didn’t use any cool colors -instead, all of the images have a reddish tinge. Oishi: Well, that’s because Kizumonogatari is a story about “blood,” after all. I wanted to see if I could express this fact—that it’s a story about “blood”—through the visual style, so in order to make the red stand out, we took out a lot of the other colors. Though I’m not sure whether we’ll do the same thing for the next chapter. —In depicting the relationships between the characters, were there particular points that you were careful about? I’m particularly interested in how Koyomi keeps his distance from others, which is really different from all of the stories/works that come after Kizumonogatari. 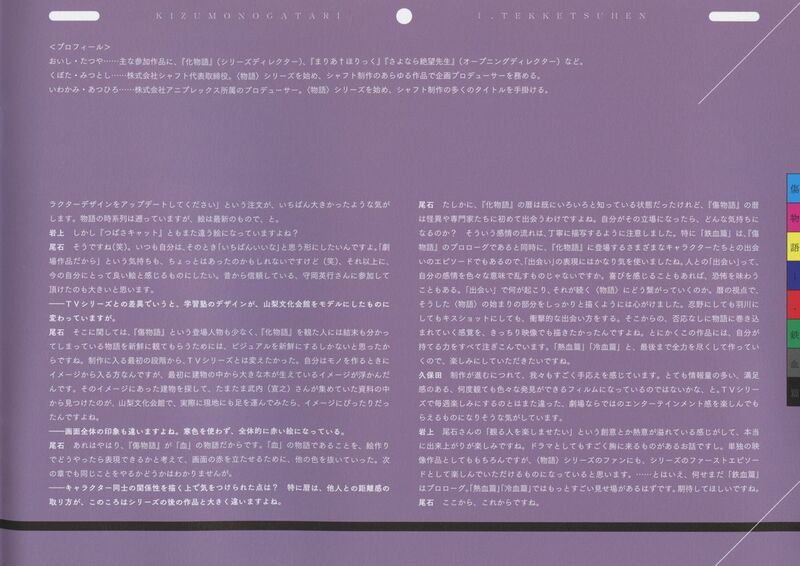 Oishi: By the time we get to Bakemonogatari, Koyomi is certainly at a point where he knows quite a lot, but Kizumonogatari is the story in which he encounters apparitions and specialists for the first time. “If I were in his position, what kinds of emotions would I be going through?” We were careful to depict that stream of emotions clearly. One thing we kept in mind was that Tekketsu is both the prologue of Kizumonogatari and also the episode where characters that appear in Bakemonogatari meet for the first time. I have into making Nekketsu and Reiketsu as well, so I hope you will look forward to them as well. Kubota: The further we progress in terms of production, the more we feel that we’re getting the hang of it. As in, the film we’ve produced has become something that contains a lot of detail, is satisfying to watch, and holds many surprises to be discovered no matter how many times you’ve seen it. It’s different from the TV series, which you could enjoy looking forward to seeing every week; with Kizumonogatari, I feel that it’ll become something that you enjoy for its entertainment value as a cinematic film. Iwakami: I can really feel it overflowing with Oishi-san’s originality and enthusiasm, with that intense desire to make something that viewers will enjoy, so I’m really looking forward to seeing the completed film. It’s also a story with dramatic moments that will really hit you hard. I think it’ll be something that can be enjoyed not only as a stand-alone film, but also—for fans of the Monogatari series—as the first episode of the entire series. …that said, Tekketsu is just the prologue. Nekettsu and Reiketsu should be even more impressive. So please look forward to it, with great anticipation. Oishi: This really is just the beginning. Another excellent translation and coverage! Anyway Japanese fans are lucky because even a movie pamphlet/program has loads of interesting information (with great cover design) which ignorant anime fans in the West will never likely to see. My prayer to anime movie premier outside of Japan: please please sell us your wares and booklets. That being said, it’s nice to read from creators’ perspective because a fan can go so far analyzing (or guessing) whatever context in the film only by himself. Regarding your last point, I agree that it is valuable to get the artist’s perspective in their own words, but at the same time, I believe that our experience of the art doesn’t *need* to be informed by the creator’s perspective to be valid. Once a work is in the world, it is all of ours to experience and interpret. As validity is concerned, I agree on your point on making own experience and interpretation. The biggest frustration for me is that a lot of anime fans have tendancy to make baseless claims and assumptions without trying to back them up with decent evidence. I see creator’s perspective as better understanding on how things are made. We don’t have to love creator’s work, but at least more options to make better educated opinion. I absolutely think there is merit in having more information rather than less. Use of more tools and resources allows us to make more interesting judgments about the material. A creator’s words are one such resource. Another of the tools at our disposal, though, is the different perspectives that others bring to the work. I think the creators themselves probably value that diversity of perspectives. I’d certainly be interested if my work hit a person/group of people a certain way that I hadn’t even considered! Yeah, well, this interview more or less confirms what’s obvious to everybody, like the distinction between the evolution of art styles in the tv show and in the movie, or the fact that it’s an Oishi work throughout, the way GitS’95 is an Oshii work more than a Shirow work.